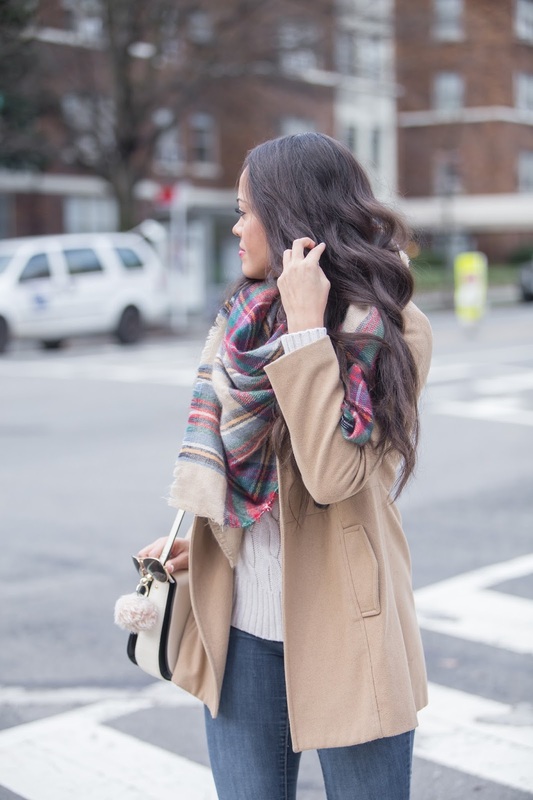 Sweater + blanket scarf + booties + coat = my winter uniform. Seriously, this combo is foolproof but can get monotonous, luckily different color combinations and prints can create a little variety. This blanket scarf is like the OG of blanket scarfs, I remember when everyone was hopping on the bandwagon and it was because of THIS blanket scarf, but now there are so many options and some, I dare say, better than this one. I can't let a good thing go though so when I start to feel like my blanket scarf is the original, boring one, I mix it in my favorite burgundy booties and throw on some camel and ivory pieces to spice things up. Linking up with Style Sessions, Spotlight, and Trend Spin! Love how you called this blanket scarf the OG! I know that this particular one got me on the blanket scarf trend and continues to be a staple for me during the winter months. I really like how the wine wedges make your whole look come together. Ah! You're so cute, girly. I'm loving the scarf.